According to [pay00] - National flag (CSW/-S- (2:3)) - Regarding the yellow stripe, the Album approximation gives it as Pantone 135c. Some other sources also agree that the shade of Colombian yellow is different from the shade used by Ecuador and Venezuela (notably Shipmate Chart and [zna99]). However, converting the given Pantone to RGB gave by my software one colour that I'd call buff, much similar to the colour used in Album as the background, and certainly not very yellow. I chose this light yellow shade to represent the Colombian yellow. Hopefully this is not much mistaken, and anyway, it serves only to show the difference from the other two Nuevagranadan yellows. I must say that some colours given in album 2000 seem quite strange. Pantone 135 is NOT yellow but it is buff and nothing else, you are right. Yellow shades in [zna99] are the same for all three states, blue is different. On page 207 of [zna99] is so as Ralf Stelter say, but when taking a look at page 128, here blue is different, indeed, but yellows are distinctly different. However, Colombian is here darker then the other two. Also in Shipmate chart, now when I look at it in daylight, the Colombian yellow seems darker then the other two, but the difference is not so obvious. 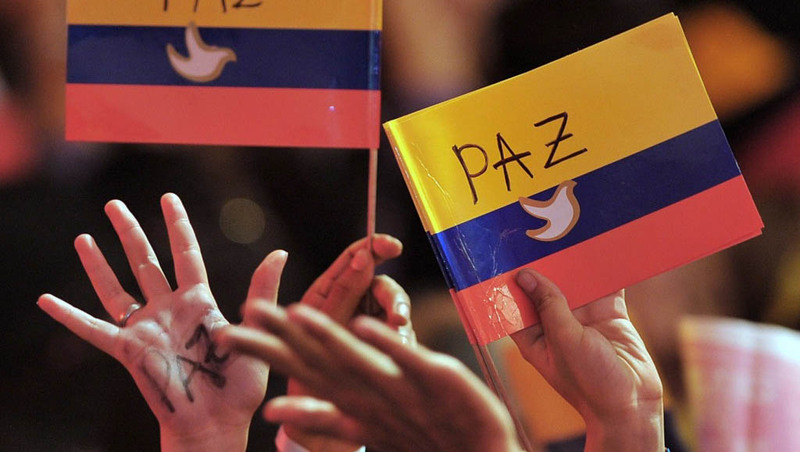 The presidency of Colombia has issued a campaign to promote national unity against violence and for peace. 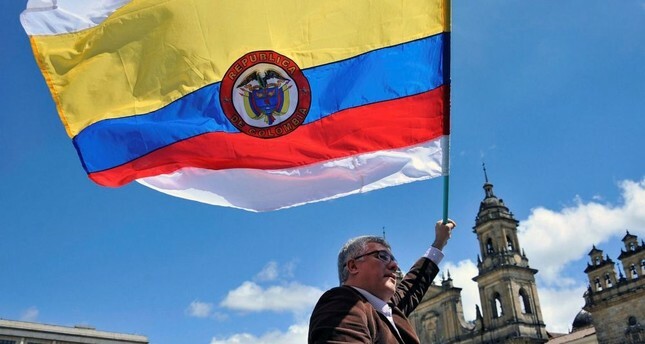 The campaign exhorts Colombians to hoist their flag permanently outside their homes, workplaces, cars, etc. All the info (not much, indeed) is at this site www.presidencia.gov.co. Though indeed Colombia's flag has a "darker" shade of yellow than Ecuador and Venezuela it is slightly lighter than the one depicted in your page. If you ignore the "shadow" effects, the shade of yellow in the flags of the new rendition of the Coat of Arms (rather than a new coat of arms per se) is the proper shade. First he explained to me the way the iris transforms light into the three primary colors [�] then he proved to me why yellow is the most warm, noble and closest to [white] light; why blue is that mix of excitement and serenity, a distance that evokes shadows; and why red is the exaltation of yellow and blue, the synthesis, the vanishing of light into shadow. It is not that the world is made of yellows, blues and reds; it is that in this manner, as if in an infinite combination of these three colors, we human beings see it. [�] A country [Goethe concluded] starts out from a name and a flag, and it then becomes them, just as a man fulfils his destiny." Very interesting writing. I've heard and read the story behind Miranda's creation of the first tricolor flag of Venezuela (which would, in turn, be adopted by Colombia and Ecuador as their national colors). However I hadn't heard the full story, so I believe it should be added to the Venezuelan, Colombian and Ecuadorian pages respectively, as they all share the same flag. Since the Colombian tricolor was first raised (as mentioned by Jorge Candeias, on his October 1, 1999 post "(on) 12 March 1806, our national tricolour was flown for the first time. Miranda was inspired by the predominant colours of the rainbow [?] and it was flown on land in the port of La Vela (in today's Department of Guajira in August of the same year" (see: Historical Flags (pre-1856), official website of the Presidency of the Republic of Colombia, it is clear that this was in fact the first time the tricolor flew over Colombia as a national flag. This flag (with specific measurements and minor detail changes, such as the width of the stripes) was the basis for the flag adopted during the Congress of Angostura (a pro tempore executive and legislative body during a time or war, established on February 15, 1819, prior to the "Campaña Libertadora" (official full name: "Campaña Libertadora de Nueva Granada", "Liberating Campaing of New Grenada), which was the final military offensive to liberate Colombia (then known as New Grenada) from Spanish rule, which in turn began on May 23, 1819 with the outline of the military plan and ended after the two major engagements of the Batlle of Boyacá and the Battle of Vargas Swamp which allowed Simón Bolívar to enter the capital Bogotá, on August 10, 1819, formally ending the campaign). The Congress of Angostura adopted the symbols (Coat of Arms and flag) of Venezuela as the ones for Colombia, because they sought to form a unified country and because the Venezuelan symbols were more in use. This was followed by the Congress of Cúcuta a de iure Congress, established on August 30, 1821 in Cúcuta. This Congress ended on October 3, promulgating the Constitution of Cúcuta which formally established the Republic of Colombia which then incorporated Venezuela and Colombia (it also included Panamá, which at the moment was part of Colombia). In this Constitution, the adopted official symbols (Coat of Arms and flag) ratified what the Congress of Angostura proclaimed, and added some details to the final design, as seen here, and you mention in the Flag Dates: by country list that Colombia first adopted its tricolor flag on November 26, 1861, which is totally wrong. It is possible that the location of La Vela, mentioned in my previous message, is actually La Vela del Coro, in Falcón, Venezuela and not in La Guajira, Colombia. In fact, in La Vela del Coro there's a promenade which shows the historical evolution of the Venezuelan flag. Also, It's important to add the following: the inspiration for the tricolor was adopted based on General Miranda's militia flag. Now, the issue is actually where did he the inspiration from? An important mention of this is that he was inspired by the Hamburger Bürgerwache (see also Hamburg Citizens' Sentinels page) but also by Christopher Columbus' personal coat of arms. Editorial Note: We present the most popular interpretations of the colours of the flag, but it is also our duty to make the difference between "official explanations", if any and general belief. There is, as a rule, no inherent meaning of colours except in rare cases where the exact meaning is mentioned in the legislation. 1. The yellow symbolizes sovereignty and justice; the blue nobility, loyalty and vigilance; and the red valor, honor, generosity and victory achieved at the high cost of bloodshed. Source: Alfred Znamierowski's World Encyclopedia of Flags, 1999. The decrees 861 of 1934, issued by the national government feeling President of the Republic the Senior General Pedro Nel Ospina and the doctor Enrique Olaya Herrera respectively, contain dispositions over the flag and the national shield. To the continuation, transcribed is the pertinent part of the flag. Article 1-The Flag--flag and standard of the Republic of Colombia, contains yellow, blue, and red, distributed en three horizontal bands, of which the yellow, placed in the upper part, will have the same width to the middle of the flag, and the other two in equal bands to the forth part of the total, having the blue in the center. Article 2-The merchant flag of Colombia will be in accordance with the established decree number 309 of 1980, three meters long by two wide; it will bring in the center a shield in an oval shape, in blue background, circled by a zone of red velvet of 5 centimeters wide, and a white star in the center, with 8 rays in 10 centimeters in diameter. The axes of the oval, inside the blue background, are of 40 centimeters the bigger, and the 30 the smaller. Paragraph-This will be the flag that one puts in use in the boats of the Colombian navy and in the accredited legations and Consulates outside of the country. Article 3-The flag of war in use in the Army, will be 1.30 meters long, by 1.10 meters wide, for the standing army; the standard, for the mounted arms, will be a meter long by one meter wide. These flags will have in the center the shield of Arms of the Republic, marked in a circumference of red velvet of 5 centimeters wide and 40 centimeters in diameter in the exterior part, within which it will be written, in gold letters, the name of the body (corps) of troops for which it represents. 208-The flag of war in use in the Army will be, after the law, 1.35 meters long by 1.10 wide for the mounted arms (cavalry). These flags will have in the center a shield of Arms of the Republic, inside an oval of red wool-cloth, in which it will be written, in embroidered letters of gold, the name of the body (corps) of the troops or military divisions for which it represents. 209-The flag with shield will only be used for the armed corps of the Nation. 210-The national flags that are raised in the barracks, public buildings, merchant ships, fortresses, etc. will be able to have more or less the same dimensions and won't have the shield. The Decree No. 1967 of August 15, 1991, which is the latest legislation on the use of the Flag, Coat of Arms and National Anthem is online at the Colombian Ministry of Communications website. Searching through the local Yellow Pages, in the last page of the 2013 Edition, a reference appears regarding the national symbols. 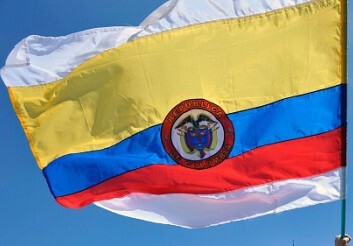 Then, they mention the official measurements for the Colombian flag: 1.80 m long by 1.4 m wide. http://ia.tmgrup.com.tr/ (source). 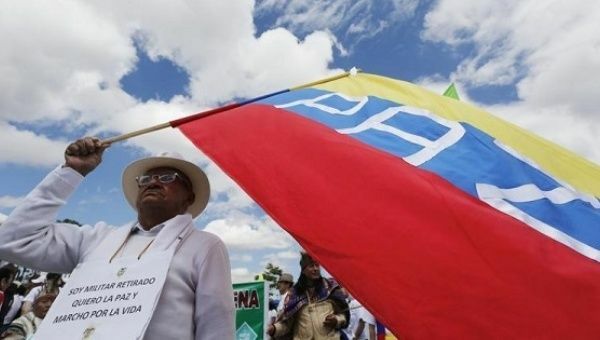 Picture caption reads: "A man holds a Colombian national flag with white stripes during a demo to demand the immediate endorsement of the new peace agreement between the Colombian government and the FARC guerrilla outside the Colombian Congress in Bogota, Nov. 30." This was in support of the Peace Process and in spite of the electoral result in the recent Peace Referendum held on October 2, in which the majority disfavored the government's initiative and the signed agreement, the government then slightly amended this agreement on November 24, and then presented it to Congress for approval. 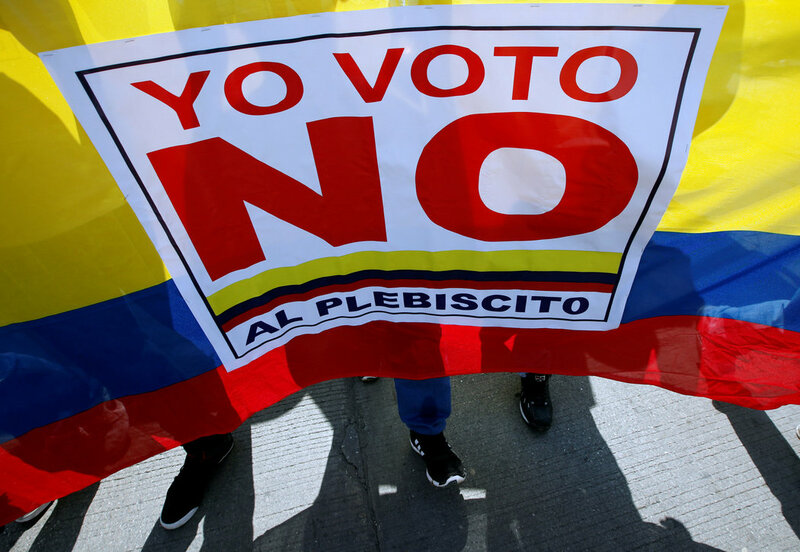 On November 29, the Senate approved the deal 75-0 and the House of Representatives approved it the next day by a vote of 130-0, without the presence of the main opposition party, Centro Democr�tico in both of them. The government then proclaimed that yesterday was "D-Day" for the beginning of the implementation of all the respective measures in the agreement, while Farc said it hadn't.